Registration now open for 2013 event: Puppet Power, the Fearless Face of Puppetry. Any artist or advocate will have their creativity sparked! There is a never-ending supply of issues and concerns in our communities. While puppets can’t directly change the world, they are a catalyst for raising public awareness.Puppets are a unique and fearless way to start important dialogue and work to make positive changes.Puppet Power 2013, presented by WP Puppet Theatre, is the event that explores this power of puppetry beyond performance. 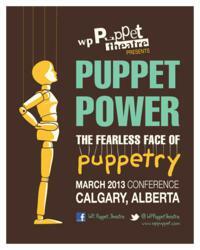 Registration is now open for Puppet Power 2013, the Fearless Face of Puppetry, that runs March 9th and 10th, 2013 at Calgary’s Coast Plaza Hotel and Conference Centre. The keynotes, hands-on workshops, peer mentoring and panel discussions are for educators, therapists, helping professionals, artists, activists, idea generators, thought leaders and students. More information, bursaries and registration, visit http://www.wppuppet.com/puppet_power.htm. WP Puppet Theatre Company is a not for profit charitable organization dedicated to creating innovative and educational performances and learning opportunities for young people, through the art of puppetry.